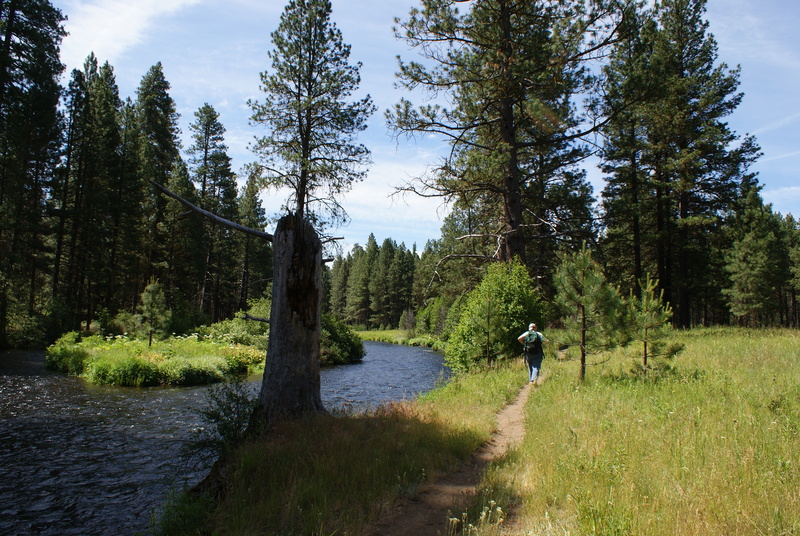 Back in June we had our almost-annual camping trip on the Metolius River near Sisters. We had a smaller family group this time, but we had perfect weather and lots of fun. 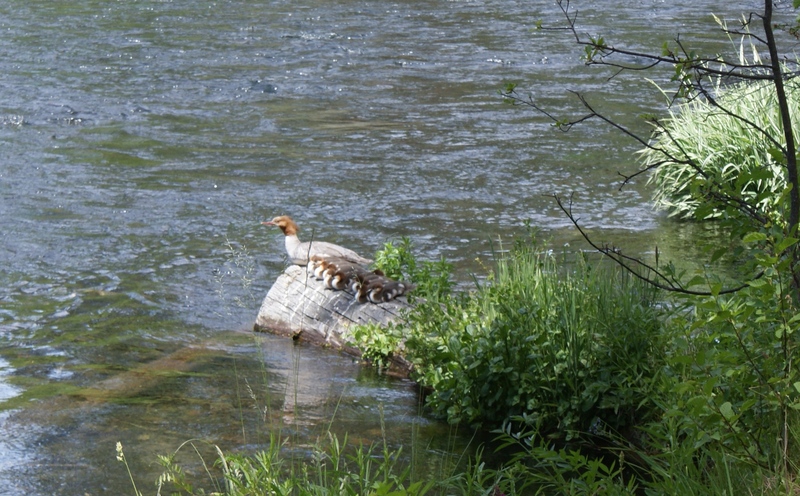 We took a hike one day along the river trail, from the Gorge Campground up to Camp Sherman. There we all got ice cream from the general store. This is a flat and easy hike, next to safe stretches of the river. We crossed over to the other side of the river at one of the campgrounds, and were able to cross back at Camp Sherman. I hadn’t realized there was a fish viewing area there, and also restrooms for public use. 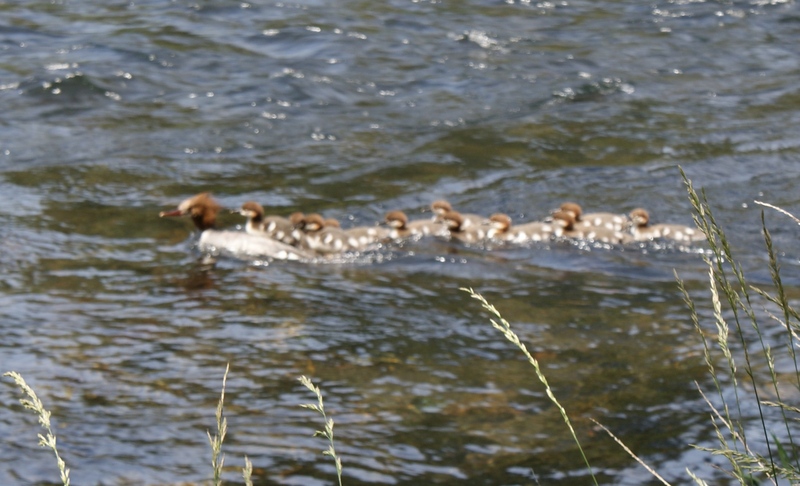 We saw many wildflowers on the hike there and back, and the highlight of the day was seeing a mama merganser with 11 babies! She was doing such a good job keeping them all together. 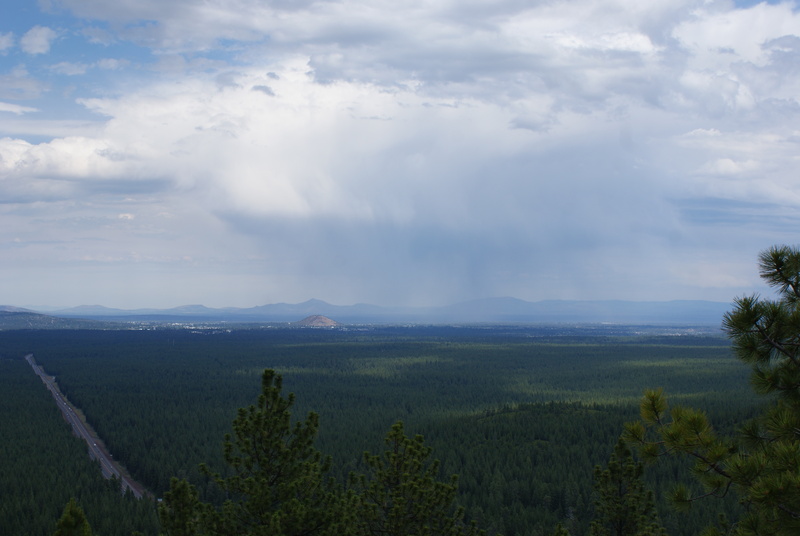 The rest of my family left on Sunday morning, so we took off and went down to the Newberry Volcanic Monument south of Bend. 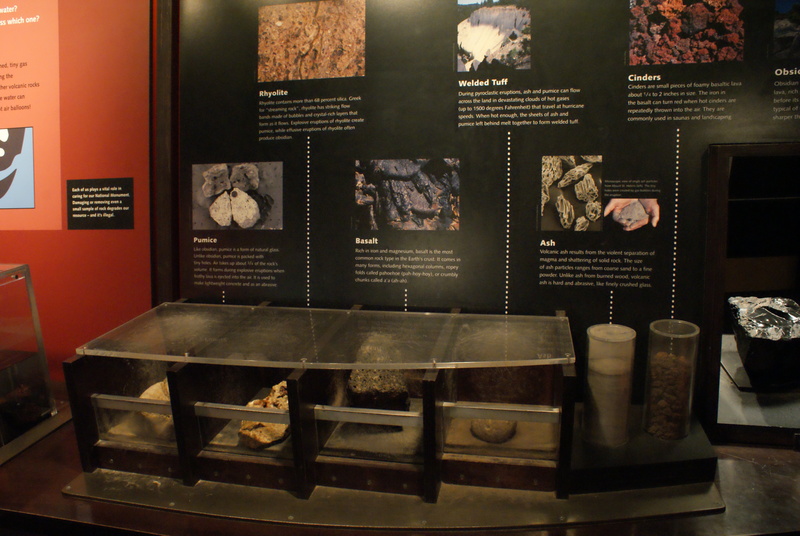 There is a visitor center at the entrance that has some nice displays about the volcano and the surrounding landscape. 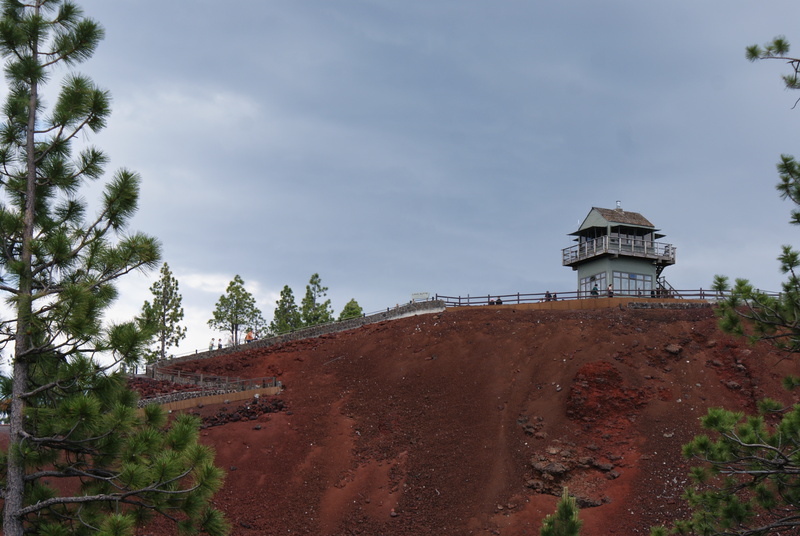 At the top, there is a fire tower that is staffed, and a Forest Service Ranger who gives information about what you can see. 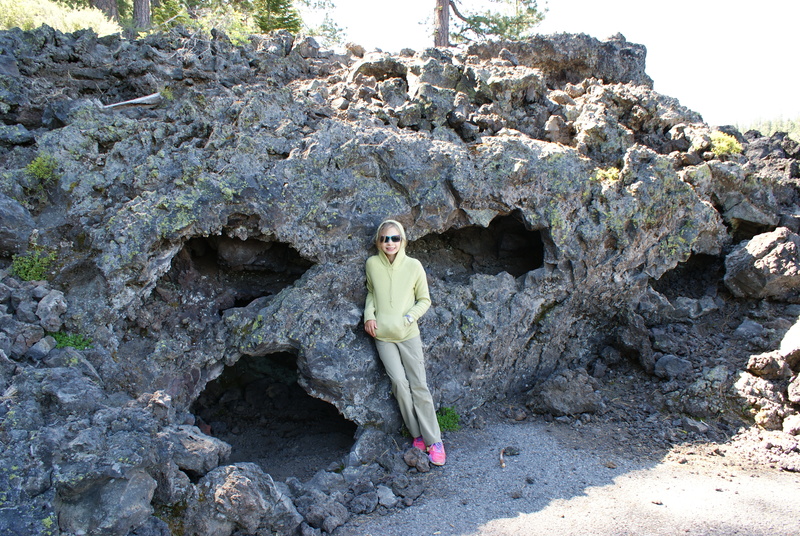 After the Cinder Cone, we drove a few miles south to the Lava River Cave. There we got our coats and sweaters on and dug out our flashlights and head lamps, and walked through the cave. 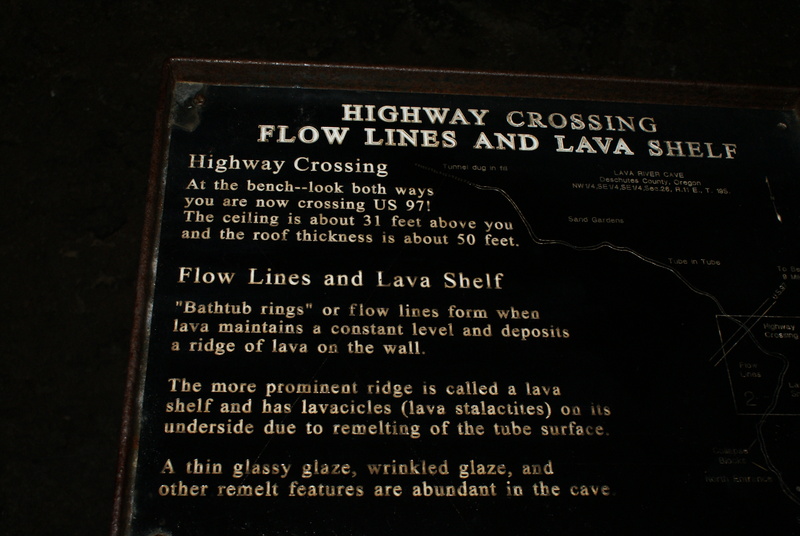 It’s a mile-long lava tube, and it’s a unique experience. Some of the ground is very rocky, and steel bridges have been built through the worst of the rocks. Much of the tube has a layer of sand on the bottom, so walking is easier, though if your lights are weak like mine, be careful of sudden changes in the level of the floor. Next time I’ll bring a different light; people can also rent big flashlights at the entrance. From there we drove south some more, to head up into the Newberry Crater. We stopped at Paulina Falls, which drains Paulina Lake at the edge of the crater. 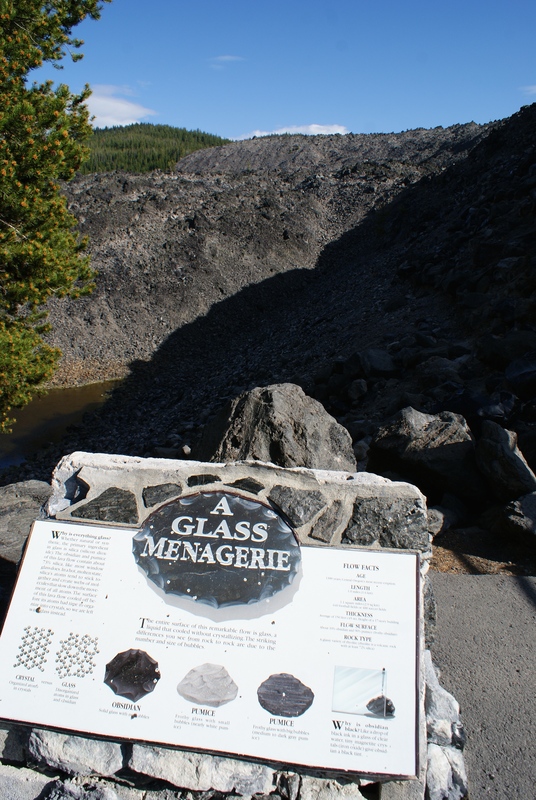 We also walked through the Obsidian Flow, a fascinating trail with interpretive signs. 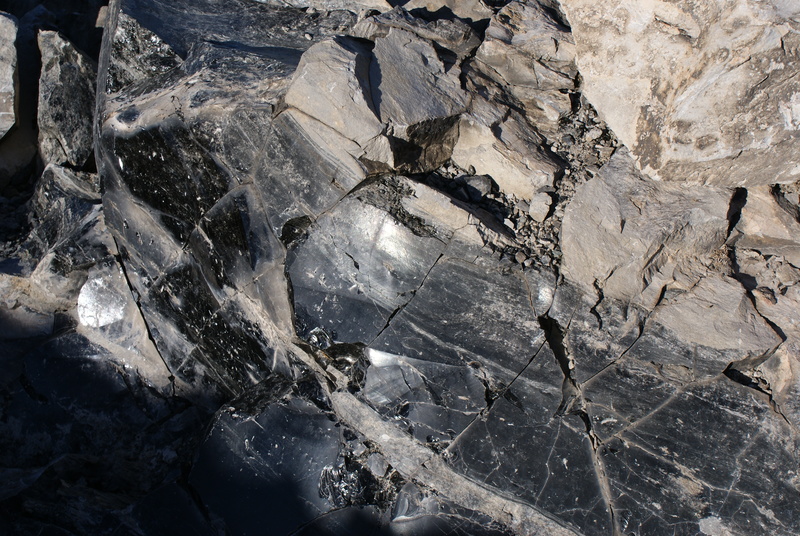 We enjoyed learning about the different kinds of lava and obsidian, and wished we could have taken some home. We marveled at the tenacious flowers and trees that were somehow able to eke out an existence there in such forbidding territory. By the time we were done with those walks, we were tired and hungry and ready to be done with sightseeing. 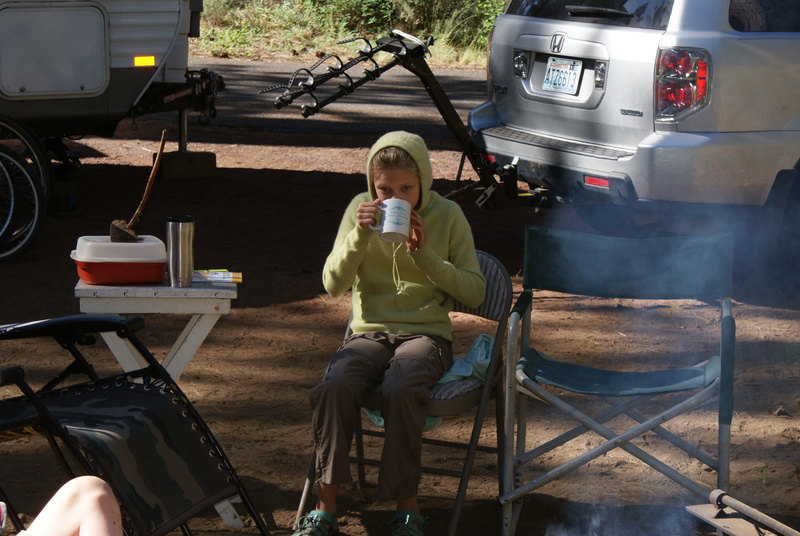 I have vague memories from childhood about not being very impressed with the campgrounds in the crater, but we thought we’d try them anyway and see what we could find. We drove to the Cinder Hill Campground all the way at the end of the road, at the eastern-most edge of East Lake. 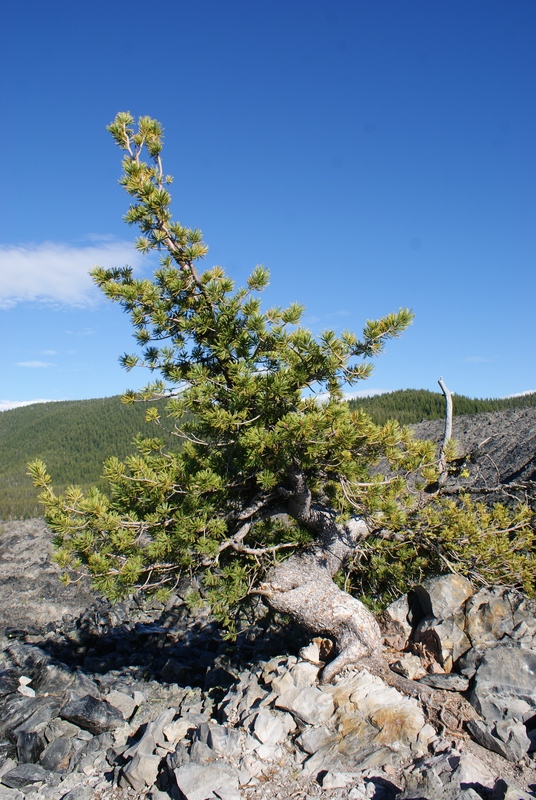 The landscape there is scrubby lodgepole pine, growing close together in a dusty soil. 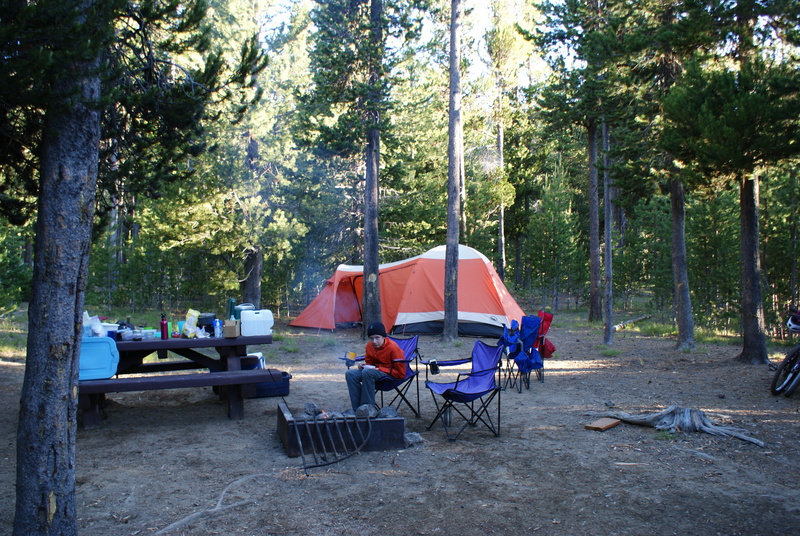 But at the farthest end of the campground, the sites are bigger, have more privacy and openness, and are prettier. We were happy with the choice we made, and hurriedly set up camp and fixed dinner. It was getting cold fast, at that high elevation (over 6000 feet) so a fire felt really good that evening, and we tucked gratefully into our warm sleeping bags. During the night I heard an owl that I think was a Northern Pygmy Owl. The Brewer’s Blackbirds took the place of camp robbers, and were fun to watch. 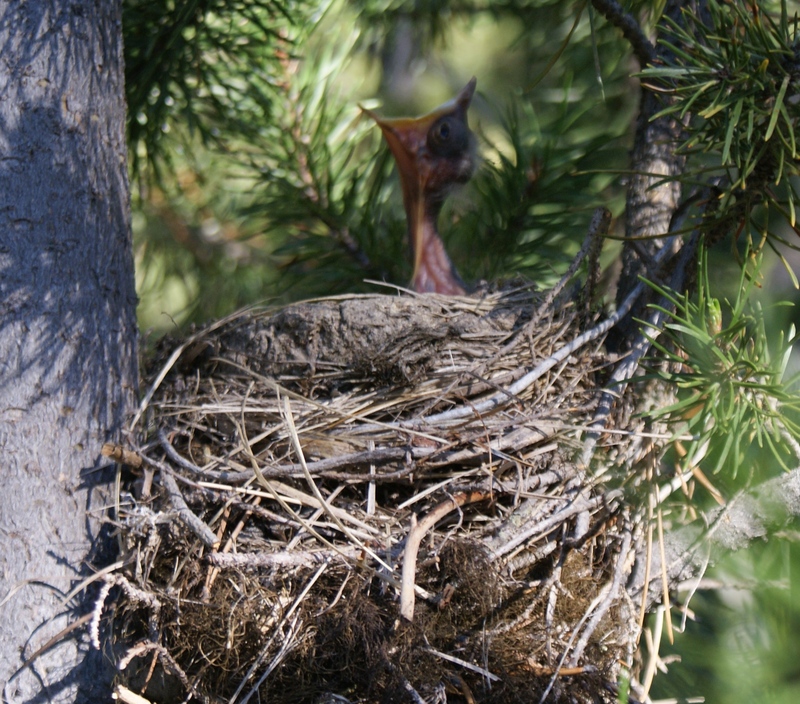 A pair of robins had made a nest at eye level at the edge of the campground, and we were thrilled to watch them feed their babies. The next morning was very cold, and we packed up as quickly as we could for our long drive home. But first we wanted to make a detour to see the Lava Cast Forest. This nature walk is at the end of a gravel road, and it takes about half an hour to reach it from the highway. 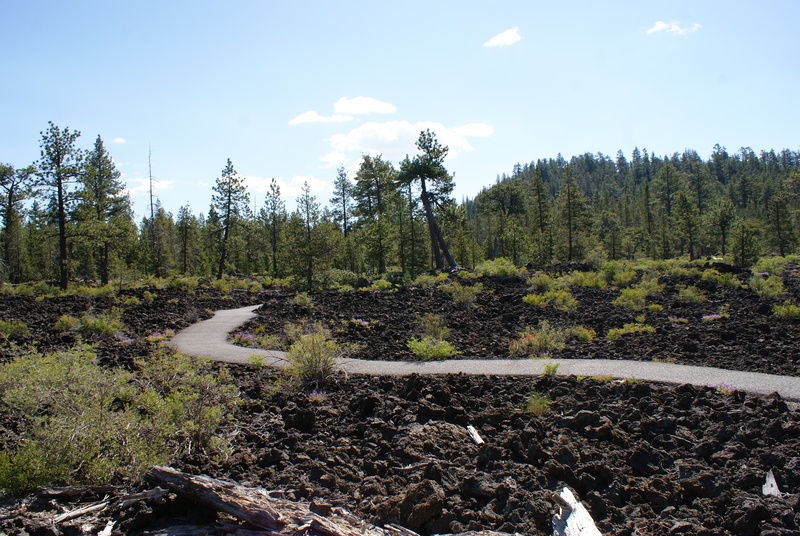 It’s a paved trail right through one of the old lava flows, and interpretive signs tell the story of how big old trees were surrounded by lava. 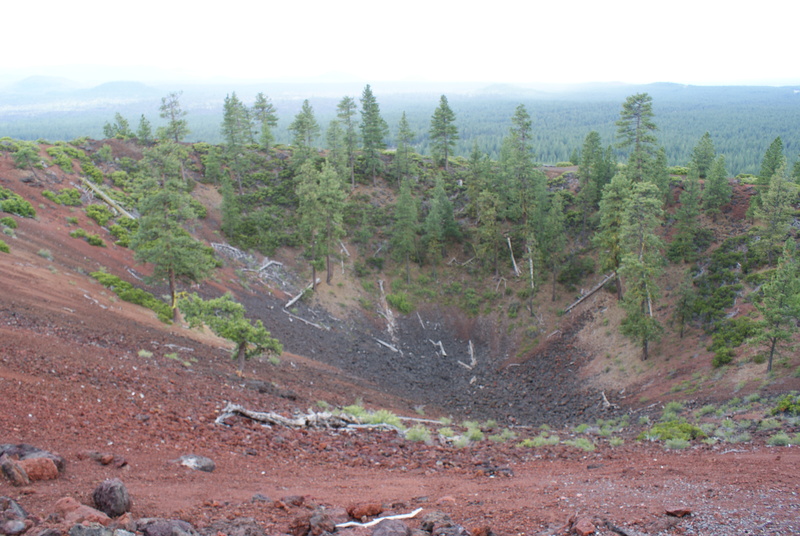 The lava then hardened and the trees rotted away, leaving gaping holes where they once stood. 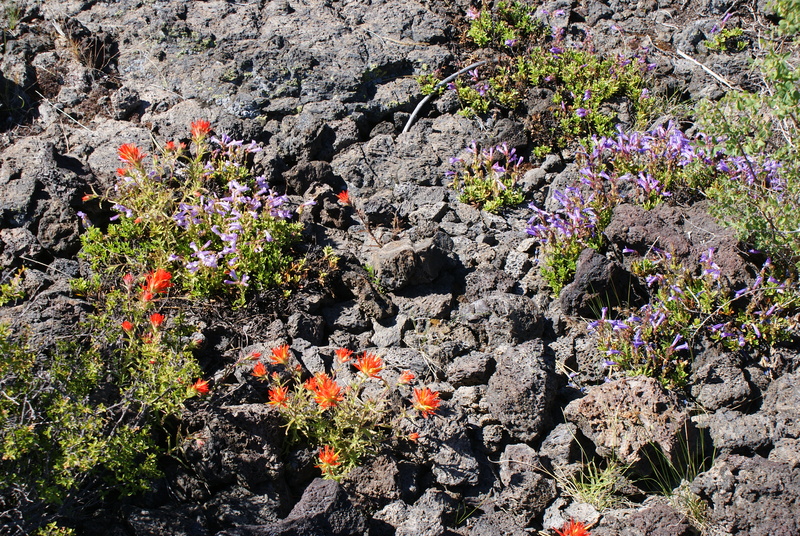 There were some colorful flowers in the middle of the lava field, and we enjoyed the one-mile walk through history. Unfortunately, though there were more sights to see, it was our last day of vacation, so we hit the road back to Seattle. 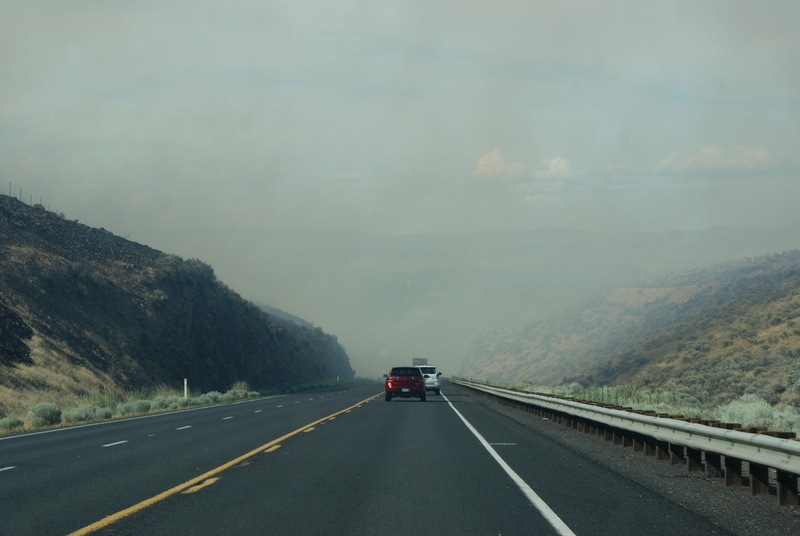 We had some excitement coming up from Oregon into Yakima, where a brush fire forced the highway to be closed. 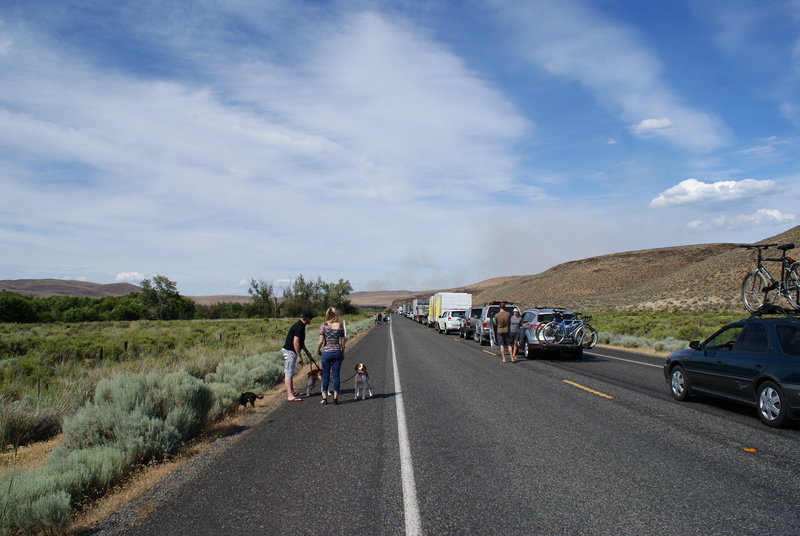 There was no cell service in that area, so we were stuck in a big line of cars that didn’t know what was going on. Thankfully, about an hour later, they reopened the highway for us to get through. The fire was still burning, but I guess they felt it was safe enough for cars to pass. 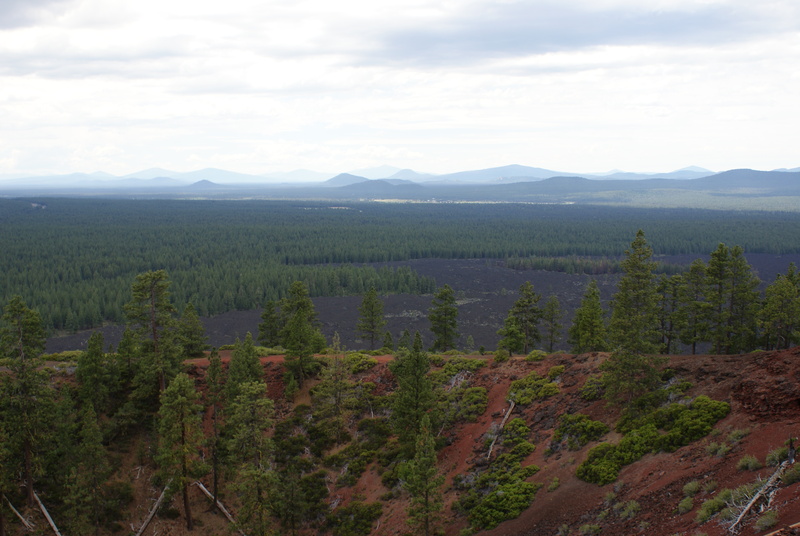 The area of the Newberry Crater was more interesting than I thought it would be, and I look forward to visiting again when we have more time. We also picked up a map of rockhounding areas in Central Oregon, and a little book of other caves in the area, so we’ll have more to do next year. 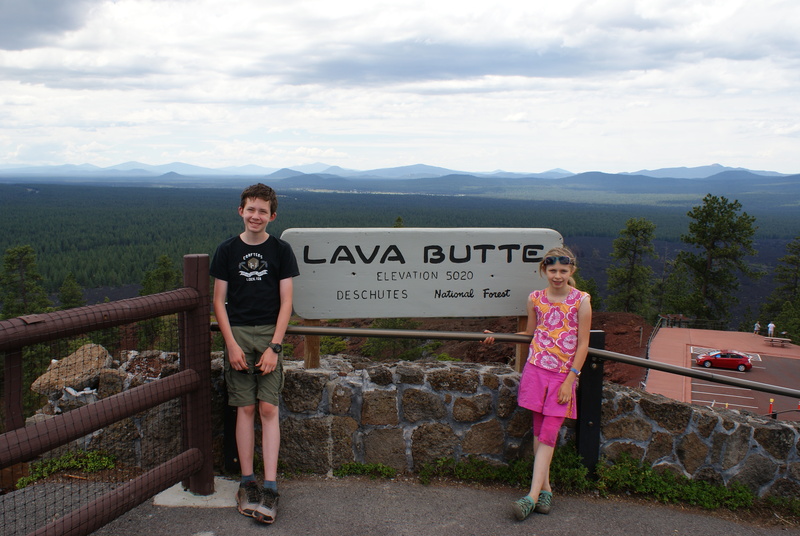 It’s definitely worth a trip if you have volcano loving kids. 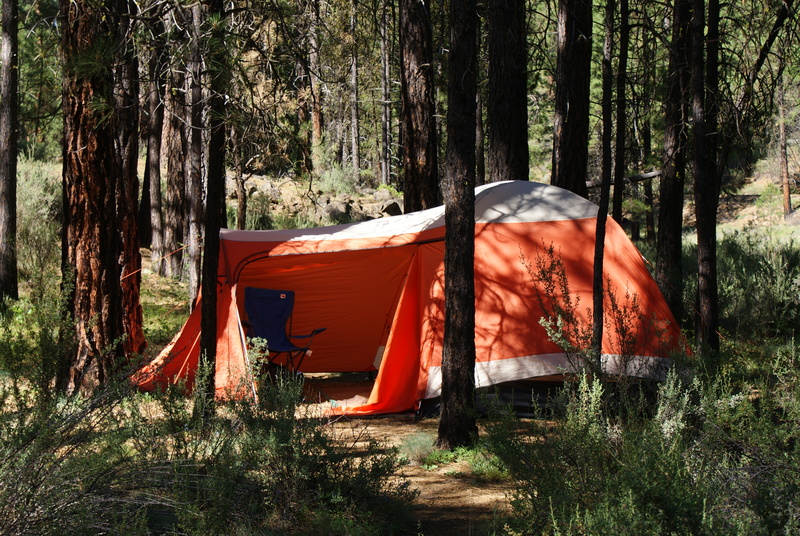 If You Go: There are several campgrounds along the Metolius River, so you’ll have your pick of places to stay. There are also cabins to rent in the area, but I’ve never stayed at them, so can’t speak to which ones are good. 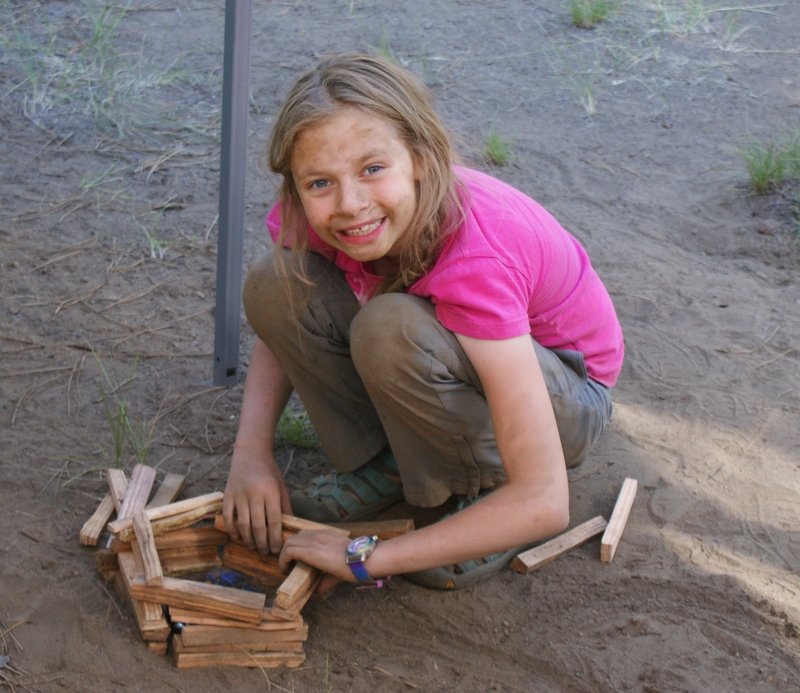 Some of the campsites do not have potable water, so pay attention to that when you are scouting them out. Most are available for trailers, without hookups, but one is tent-only (I believe it’s Riverside.) 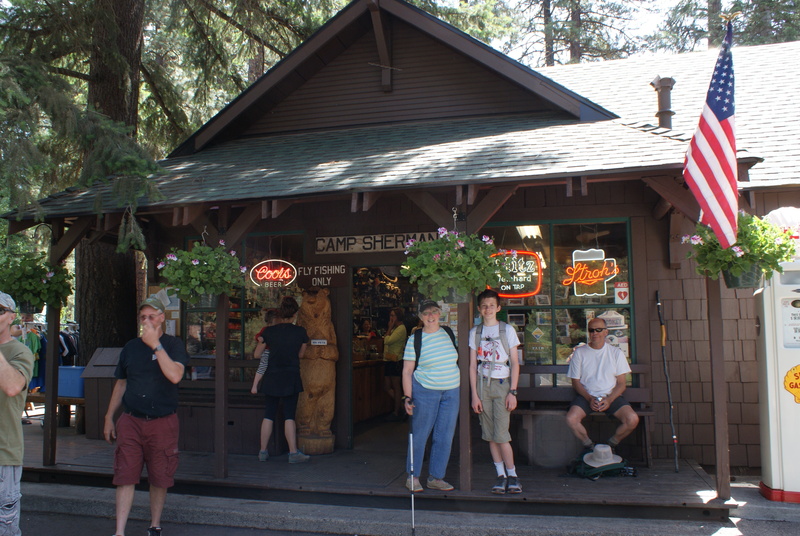 Camp Sherman has a store with necessities and treats, but if you need more provisions or gas, stock up at Sisters. 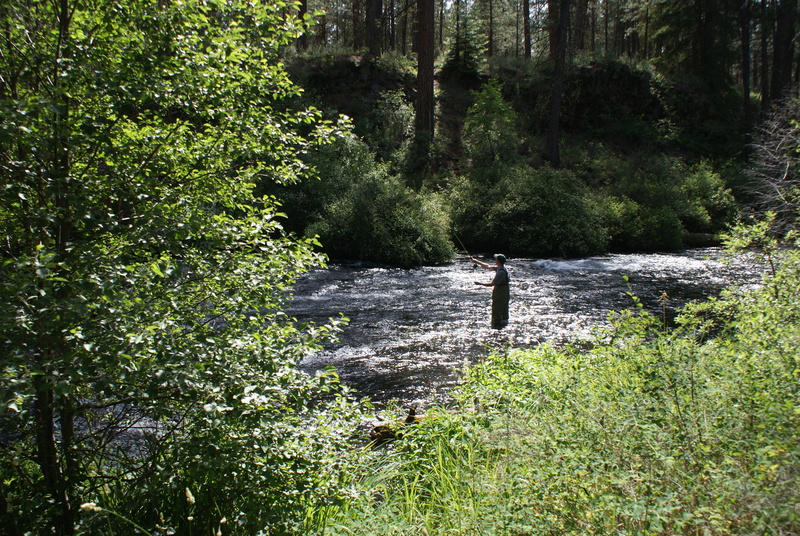 The Metolius River Trail runs along the Metolius, through the campgrounds, from Camp Sherman down to the Fish Hatchery. (As I was researching this post, I found the trail continues on below the fish hatchery, so intrepid hikers have many choices for distance and elevation gain.) From the Gorge Campground to the store and back is 4 miles RT, with negligible elevation gain. 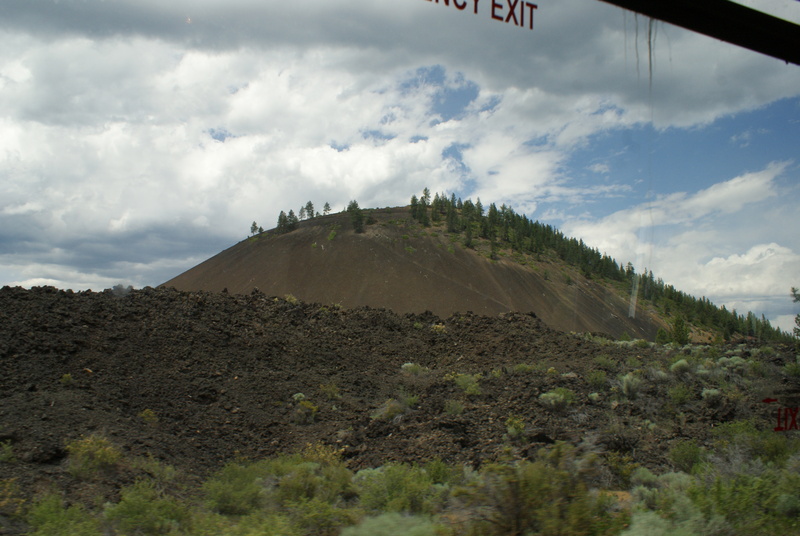 The Newberry National Volcanic Monument Lava Lands Visitor Center is located 8 miles south of Bend on Hwy 97. The Monument requires a $5 daily entrance fee, which can be covered by a NW Forest Pass or other federal annual pass (we used our Interagency Annual/America the Beautiful Pass). 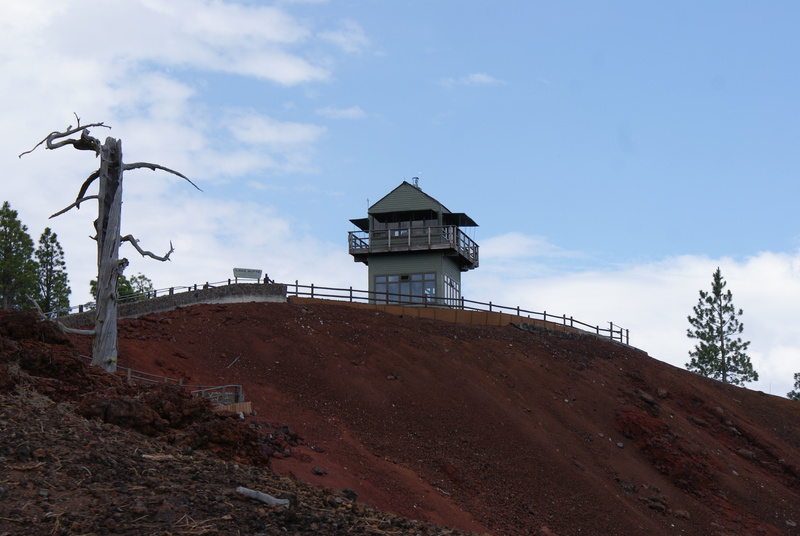 Lava Lands Visitor Center is open generally May through October. The shuttle bus runs through September 7 this year (2015). There are several trails you can take near the Visitor Center. 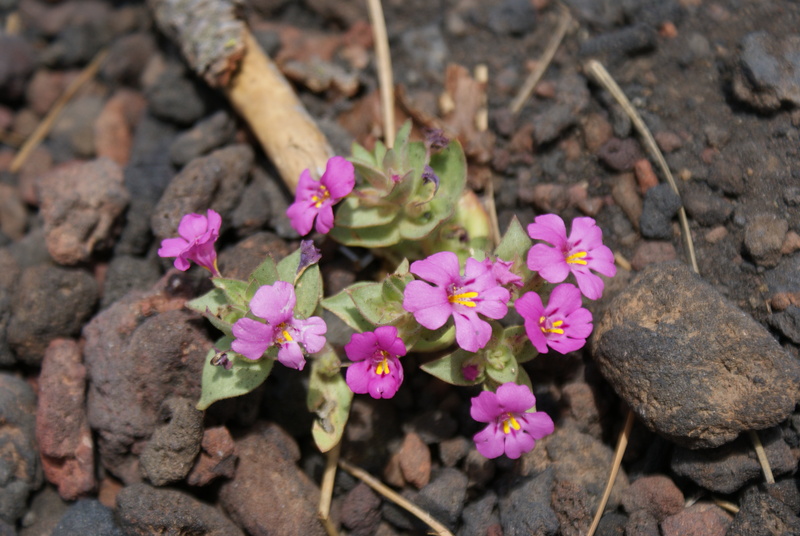 The Lava River Cave is open May through September, with times and days varying by month. 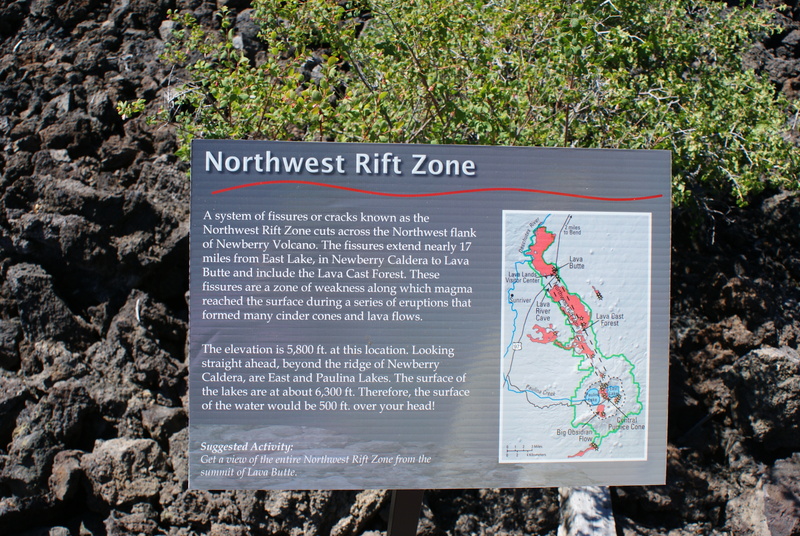 It is south of the Lava lands Visitor Center on Hwy 97, and is well signed. 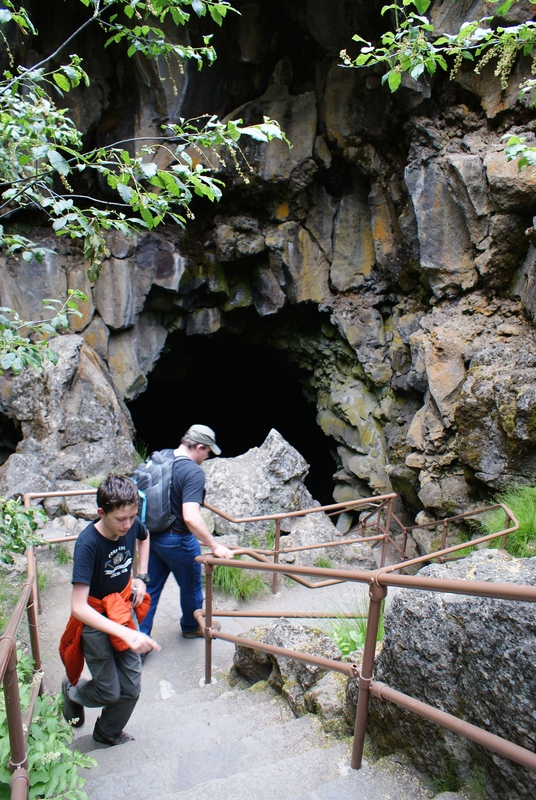 The cave is free, but you’ll need to display your NW Forest Pass, Federal Annual Pass, or the day pass (if you picked one up at the Lava lands Visitor Center).You can rent a light or lantern for $5 from the kiosk at the entrance. Though the hike is only 1 mile to the end of the tube, you’ll need to allow 1.5 – 2 hours to navigate the trek. The last people are allowed in one hour before closing. No pets are allowed; it’s generally too warm to leave them in your vehicle, as well, so I recommend making other arrangements. Wear closed-toed, sturdy shoes and warm clothing; it stays around 42 degrees in the cave year-round. Bring water and consider a snack, as well. Make sure you use the restroom before entering the cave, as there are no restrooms inside. You can download this brochure for more information about the cave, or purchase the inexpensive guide in the gift store at Lava Lands Visitor Center before your hike. 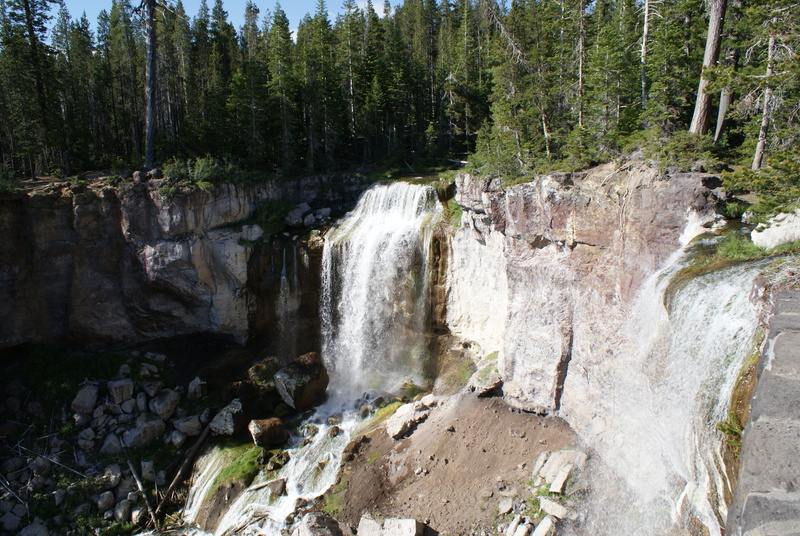 Paulina Falls is located just before the Paulina Lake Campground, on County Road 21 (the road that leads into Newberry Crater off of Hwy 97.) There is a parking area, picnic tables, and restrooms. We took the short path to the overlook, but there is also a 1/4 mile trail that leads down to the base of the waterfall. 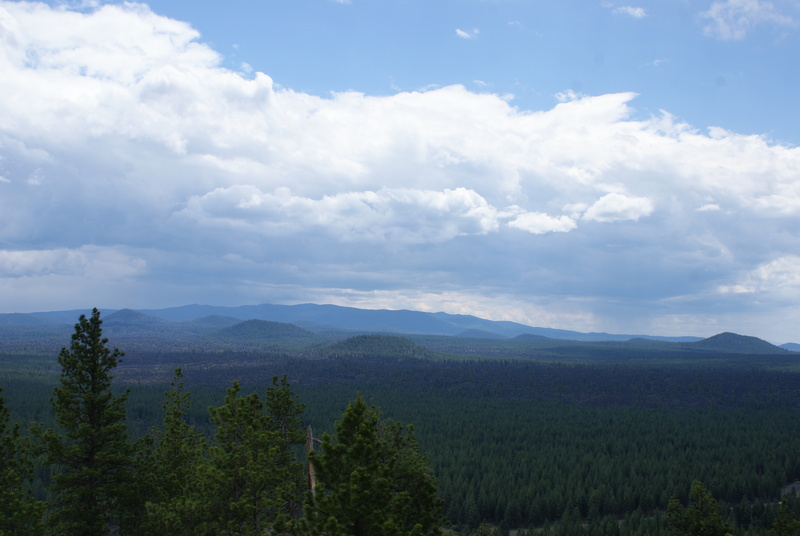 It’s a beautiful spot, refreshing among the dusty lodgepole pines. Once again, you’ll need your pass for parking. 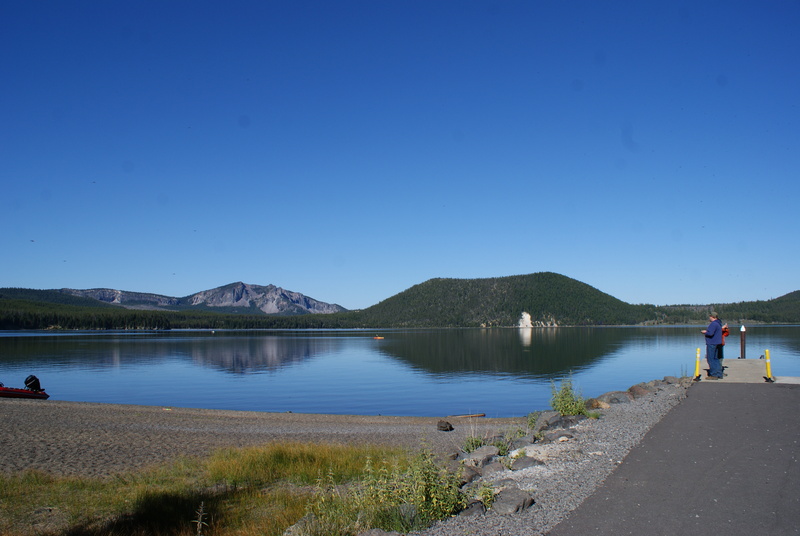 The Obsidian Flow Trail is located up County Road 21, signed for Paulina and East Lakes, inside the Newberry Caldera. 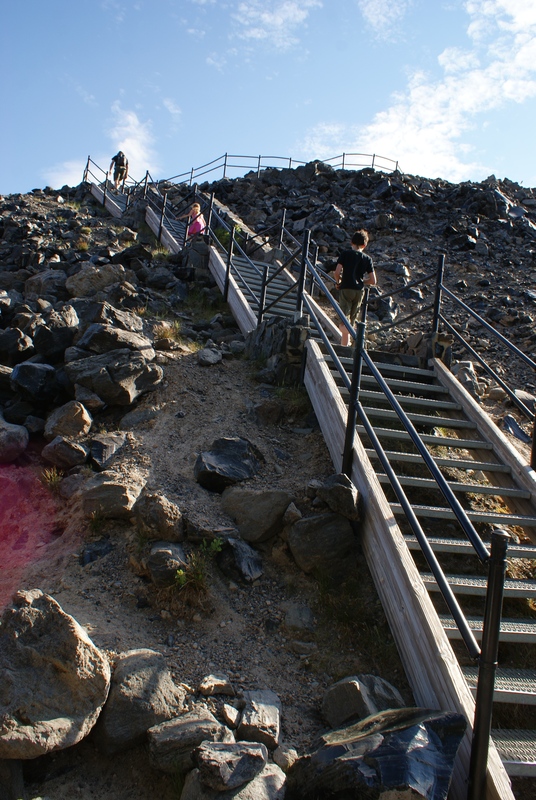 It is one mile in length with some stairs and perhaps 100 – 200 feet elevation gain. The parking area requires your NW Forest Pass or other Federal Annual Pass, or a $5 fee. There are restrooms at the parking lot. 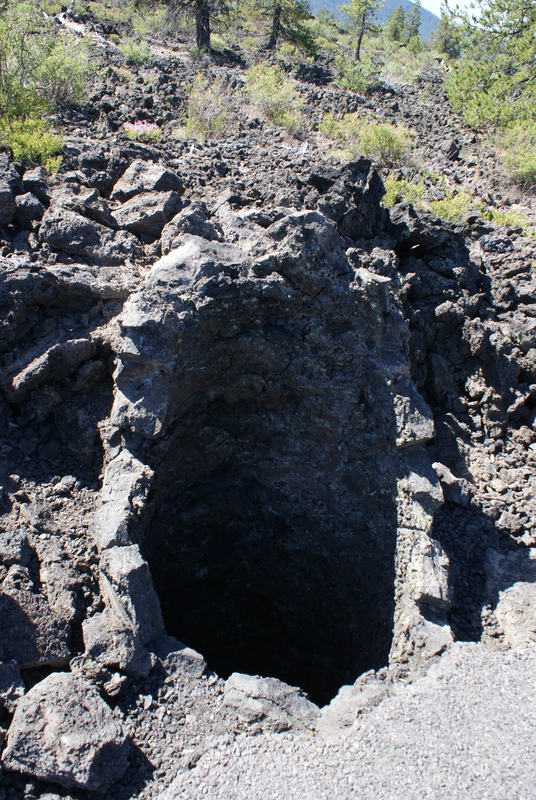 You will walk up through the youngest lava flow in the state, admiring the obsidian and black pumice. 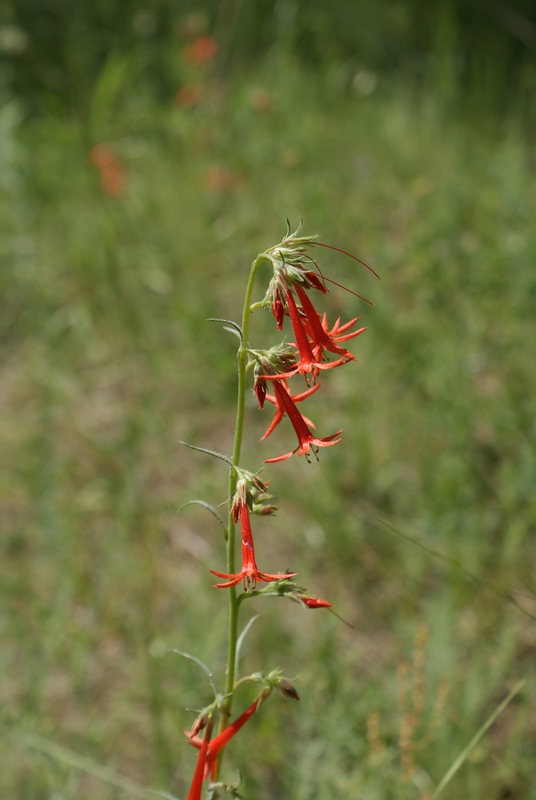 Interpretive signs explain some of the science of what you are seeing, as well as other natural history facts. 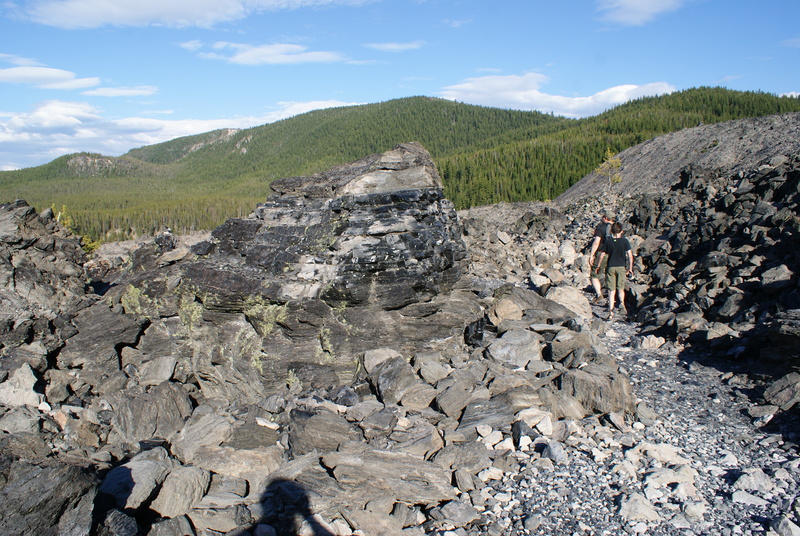 Collecting obsidian or pumice is strictly prohibited. We were there on a hot day and were wearing our Keen sandals, and I regretted not having closed-toed shoes. 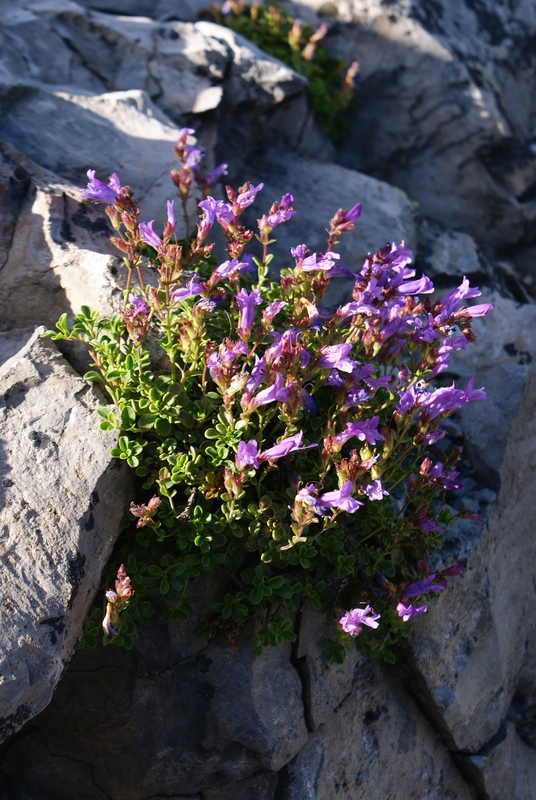 We loved the tenacious flowers and trees that somehow grew among the glassy rocks. 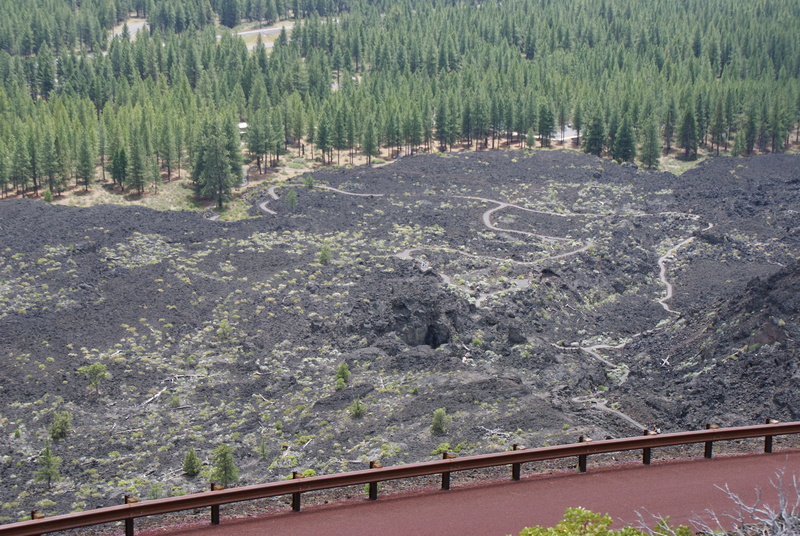 The Lava Cast Forest is located off Hwy 97, 10 miles up Forest Road 9720. Allow 30 minutes to drive the washboarded and mildly potholed gravel road. You’ll need your NW Forest Pass or alternative to park here. There are restrooms and picnic tables at the trailhead. It’s generally open June through October. 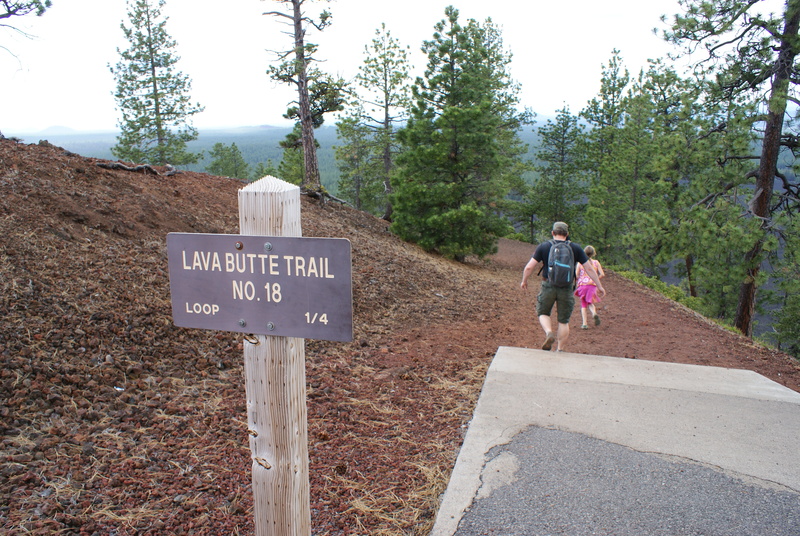 The hike is a one-mile gentle stroll along a paved path, through a lava flow. 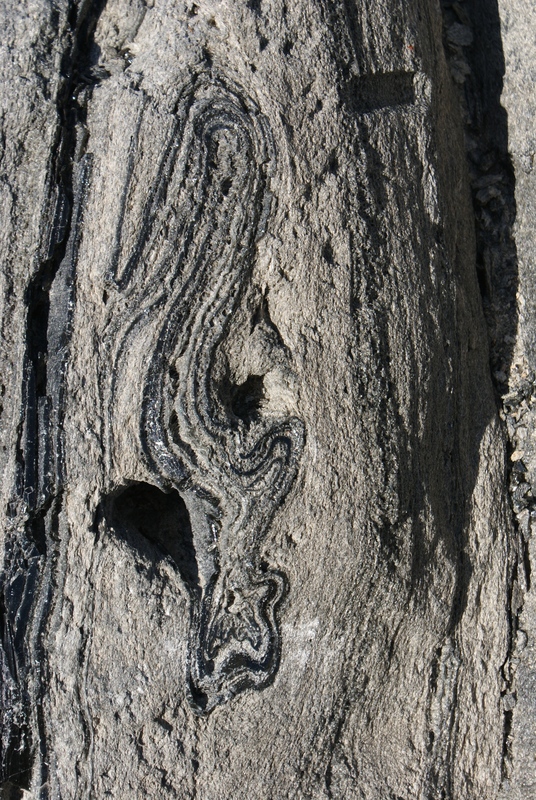 You’ll see examples of lava casts of large trees that were in the way of the flow. The flow hardened around the trees, and they burned or rotted away. 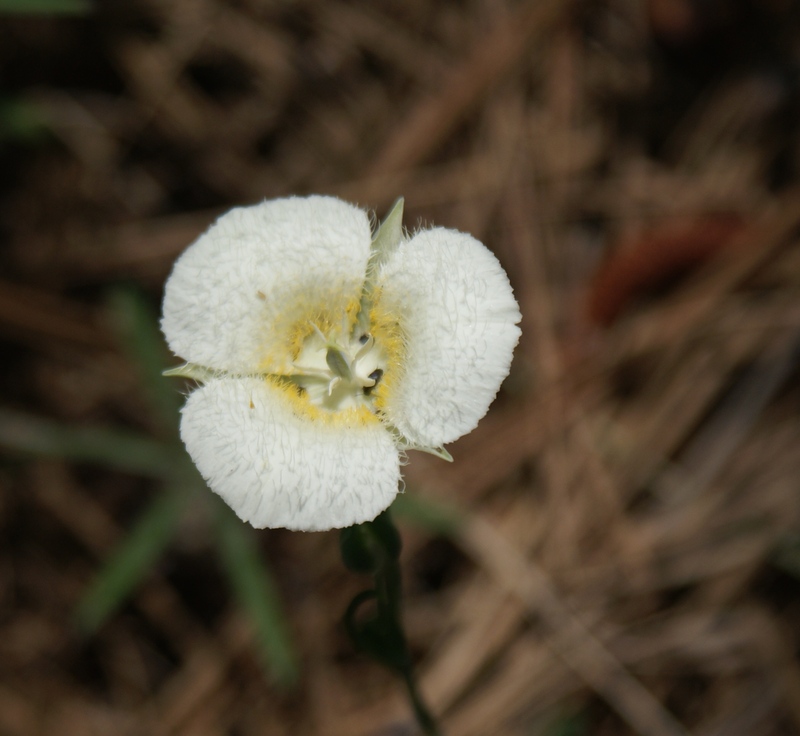 Wildflowers bloom and islands of trees are taking hold.